ANIOSGEL Plus is an ideal hand antiseptic in fast moving environments such as dialysis clinics, ambulatory care centers and hospitals. The gel form makes ANIOSGEL Plus user friendly and adds moisturizing and softening properties. ANIOSGEL Plus is formulated without perfumes or colors for better tolerability. 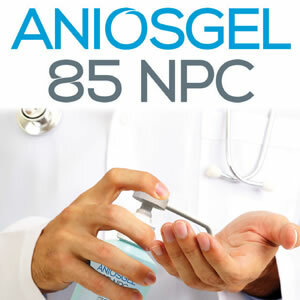 The proprietary special formula makes ANIOSGEL Plus effective within 30 seconds for antibacterial hand wash, and 5 minutes for surgical washings. HIV-1 **** Inst. Pasteur 5 log I.P. Apply 3ml of ANIOSGEL Plus in the cupped hollow of your hand. Place fingertips of other hand in solution and swirl for 10 seconds. Transfer solution to the cupped hollow of your other hand. Place fingertips in solution and swirl for 10 seconds. Rub hands together thoroughly until completely dry, for at least 30 seconds. Rub hands thoroughly until completely dry. Make sure solution contacts fingertips and interdigital spaces. Repeat the application two more times for a total of at least 5 minutes.